I finished Hallie’s puppy picture. I framed it in a simple hoop – the picture is without flash because it looked like the flash faded the colors too much. There’s a bead “tag” on his collar and 4 purple satin stitch flowers and 3 red lazy daisies. 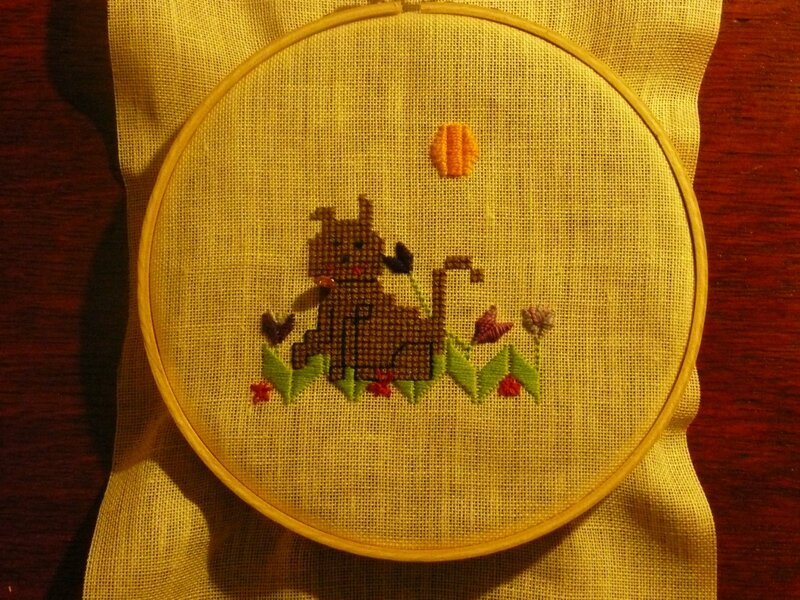 The grass and sun are satin stitch, too. I’m happy with it, and I think she’ll really like it. We decided on her costume for Halloween. I’m not really big into dressing up or making a big deal out of it, but if the kids want to wear costumes for the Harvest Party at church, we’ll make it happen. Hallie decided she wants to be a flower, and I have the materials to make her a cute, unique costume. I just had to get some pink tulle at Joann’s (50% off through today – only $0.74!). My mom and I will make her a petal skirt and a poncho out of some old green curtain panels, and stretch the tulle over some pipe cleaners to make daisy-style petals. I’ve decided on Christmas presents for most of my family. I have to start now, because for the first time I’ll actually have to ship most of them. I’m not discussing what I’m making, since some of them visit here – and that’s killing me! I’ll have to post pictures after Christmas.